Every time we write an update, we take time to look back over our lives and ministry. And always, we are grateful for God’s goodness and mercy to us. Indeed, His work in our lives cannot be described because of its depth and height. Especially, this time, we don’t know where and how to start this letter, because God did many things for our family from December 2011 until even this very day. Well, here are some of those items we want to share with you. It was June of 2005 when we arrived in Kenya. The Lord has given us various opportunities in Kenya and Tanzania, and we thank and praise Him for such opportunities to be used as His instruments in Africa. We enjoyed our time without realizing the need of a furlough. In the first half of 2012, the Lord provided a time to take a rest from our regular routine. We actually did not know what to do with this break since it was our first long break since 2005. But it was our Lord who opened to us various opportunities of visiting friends and churches. In three and a half months our family had a good rest, and at the same time was refreshed and encouraged by many friends. As it was the first time, we did not expect some changes through furlough. However, after the break, we realized that it gave us a blessing and a recharging time for us for another term of service. Therefore, we thank God for such a precious time we could have as missionaries. Through the last seven years, many brethren have prayed for our family and ministry; however, we have not met many of them personally. Sometimes, we were wondering who they were. Well, we thank God because during our furlough, we were blessed by those co-laborers in Korea, America, and Singapore. Also, it was such an encouragement to see some of the recipients of our prayer letter. We want to thank all of those friends who warmly welcomed us during our furlough. Indeed, the Lord blessed us through fellowship and edification. We have been so much encouraged and challenged by our friends’ devotion and commitment for missions in their home land. Rwanda – Many times Rev. and Mrs. Mark Kim shared with us in their prayers of building more colleges in Africa. Well, following the start of BCEA in Tanzania, the door was now open in Rwanda in 2011. With Rev. Kim’s oversight, Eben had opportunities to visit Rwanda twice for surveys and processing business. Yes, this country has been stained with a painful history, but we have seen the hand of the Lord who has restored this nation and established a good setting for a new ministry. There are many things yet to be done and needed, so, please labor with us for this ministry with prayers. We are looking forward to seeing a great work in the future. Ethiopia – The Lord gave Eben and Joshua (BCEA lecturer from Singapore) a special opportunity to participate in a Mission Conference in Addis Ababa, Ethiopia in December 2011. It was held by Gethsemane Bible Presbyterian Church in Singapore with her pastor, Rev. Dr. Koshy. The Lord gave Gethsemane BP Church a task to establish the church and the college with Rev. Ephraim Chiracho, an Ethiopian alumnus of BCEA and Far Eastern Bible College (FEBC). It is always a joy to see how our God extends His work in the needed areas. Also, we had a great time together with some of the BCEA and FEBC graduates (pictured right) from Singapore, Ethiopia, and the Philippines. Do pray for the ministry in Ethiopia as they carry on the church and educational tasks. When we were in Kenya, Mi-jung shared that she was somehow getting tired too easily. So, when we went to Korea, she decided to have some special tests. Through an ultrasound and biopsies, the doctor diagnosed a cancer in her thyroid gland. Although many were saying that a problem in the thyroid is not very harmful, it was not easy to take in the beginning. However, by our Father’s grace, she had a successful operation to remove the cancerous tumor back in February. We thank our God because it was the right time (furlough) to have an operation. Also, He led us to a good hospital with godly doctors. Most of all, our Lord gave us peace and joy through the time of worries. We also want to thank all who prayed for Mi-jung’s operation. Continue to pray for her so she will recover completely. We want to thank our Lord for His provision of all the expenses during the furlough. Actually, we were very concerned about the travel expense and the hospital bill. But the Lord moved His people to supply the needs. Also, another thing to praise the Lord for is the successful operation for Eben’s father’s cancer. Actually, his health condition gave Eben some burdens. Therefore, it was good news for Eben about the improved condition of his father. Still, he is having a hard time in recovering. So, we request prayer for his health and pastoral ministry. Lastly, we thank God for His protection and provision over our children. While Eben and Mi-jung were in America for some visitation, the children were left with their grandparents in Korea. It might not be an easy time for both parents, but it was a great opportunity for the kids. Since they had spent most of their lives in Africa, living in Korea was a brand new experience for them. We thank God for the opportunities. Well, here are some prayer items for which we want to request you to pray. Pray for the faculty members and the students at the BCEA campus in Nairobi and Tanzania. Pray for the “Alumni Reunion Conference” to be held at the end of August. Pray for the ministry project in Rwanda that is mentioned above. Because the Lord has provided another pianist at BCEA, Eben is planning to visit various churches in June and July. Pray for God’s protection on the road. During her recovery, Mi-jung is released from the responsibility of Ngomongo Kindergarten. She is now concentrating on the kindergarten in the Bible College only. Continually pray for this responsibility. Pray for God’s wisdom as Eben teaches various classes at BCEA. Pray for Mi-jung’s health, and for God’s mercy. Our oldest daughter, Ha-eun, needs God’s guidance and wisdom in her study at the international school, which she will attend for the first time. 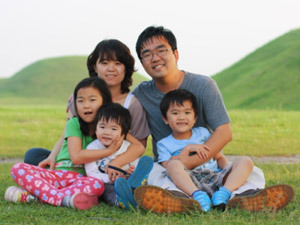 Our other two children, Ha-jin and Ha-hyun, need God’s protection as they live in Africa. Well, during our time of furlough, many asked us how long we would be in Kenya. Actually, we do not know. But we desire to serve the Lord until the coming of our Lord Jesus Christ. So, continually, co-labor with us in sending missionaries so that we may continue our mission works as sent-by missionaries. Grace to you always. We give thanks to the Lord for His grace upon your lives and how you are serving Him in East Africa. May this grace remain abundant for you always. 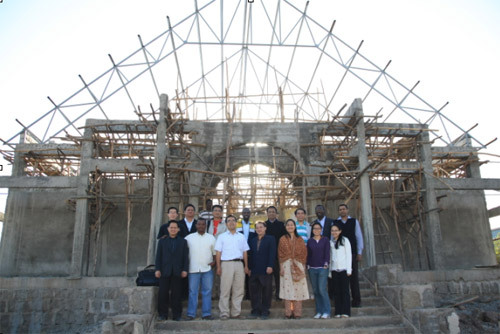 I write to ask you to please put us in contact with Dr. Mark Kim of Bible College of East Africa. We want to invite him to participate in a Global Theological and Ministry Training Survey being conducted by our Center. So we need his email contact to be be able to send him the Invitation and Survey Questionnaire. And if you yourself is also involved in training and teaching in any Bible School or college, we will also be pleased to invite you as well. Could you please send us your email and that of Dr. Mark Kim to enable us send the Invitation. Thank you so much and God’s blessings. Grace to you ever more. Could you please remove the mail we sent to you from your web-page? It was NOT meant for the web. Thank you and God be with you.